The venerable Maximus the Confessor was born in 580 A.D. in Constantinople to a noble family and made brilliant philosophical and theological studies. Around 610 Emperor Heraclius entrusted him with the position of his first secretary, which the Saint honored and brightened with honesty and integrity of character. After three or four years, however, he abandoned this much sought after position and became a monk at the Monastery in Chrysoupoli (Skoutari), on the other side of the Bosporus, opposite Constantinople. In 618 he became a devoted disciple of Monk Anastasios, staying with him throughout his life and even was with him at his martyric death. Saint Maximus spent all his life as a simple monk, although he was the most brilliant intellect of his time. He fought with bravery and zeal against the Monothelite heretics. The convening of the Lateran Synod in 649 by Pope Martin I condemned Monothelitism, due to the struggle and efforts of Saint Maximus, who went to Rome for this purpose. The decisions of this Synod were sent throughout the world. 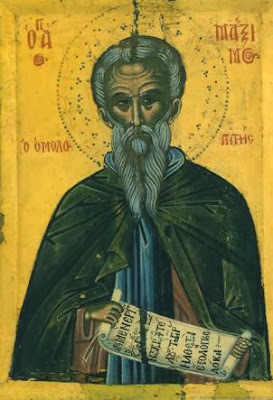 Saint Maximus, however, was arrested, tortured and exiled to Vizye in Thrace. Then they cut off his tongue and right hand and sent him to another exile to Lazica, on the eastern coast of the Black Sea. There he left his last breath at the age of 82, exhausted by his sufferings and old age. But he continues to teach and inspire through his writings, which exude the fragrance of the Holy Spirit. The most important of them are: "Ascetic Discourse", "400 Chapters on Love", "Questions and Responses", "100 Chapters on Knowledge", "Regarding Various Questions on Saints Dionysius and Gregory", On the Our Father", "Mystagogy" and more. First, important and noteworthy is all that Saint Maximus writes in the preface to his "400 Chapters on Love", which he addressed to "Elpidius the Presbyter", who, as it appears, asked him for this discourse: "I request that you not be annoyed by anything that is said; I have simply fulfilled an obligation." At first he clarifies that everything mentioned in this text are not reflections of his intellect, but selections from the wisdom of the Holy Fathers, whose words he investigated, and then tells the recipient of this discourse the way it should be studied to be benefited spiritually. While studying it, he will need to look for the benefit which comes from the words, overlooking the style which lacks charm, and to pray for the author. Out of humility he adds that the author of this essay is bereft of spiritual profit. Further, he emphasizes that the study of this essay must not be out of curiosity, but with the fear of God and love, because without the Grace of God one cannot see the depth of what is read to benefit from it. "Perhaps it might happen that something useful to the soul will be revealed out of them. This will happen completely by the Grace of God to the one who reads with an uncomplicated mind, with the fear of God and with love. But if someone reads this or any other book whatever not for the spiritual profit but to hunt for phrases to reproach the author so that he might then set himself up in his own opinion as wiser than he, such a person will never receive any profit of any kind." The same, of course, happens with audiences of spiritual discourses. Those wishing to be fed spiritually, to be supported and comforted, should listen with humility and fear of God. Further, they should pray for enlightenment from above to the one giving the discourse, and that God may open their minds that they may understand everything they hear. Conversely, if you are trying to hunt for phrases to isolate and thus criticize the speaker, they will never be benefitted. Second, characteristic is all that Saint Maximus refers to regarding the word of God, at the end of the first hundred Chapters on Theology: "The manna which was given to the Israelite people in the desert is the word of God, which is sufficient for all those who delight to eat and changes taste depending on the difference of their desires, because it had every quality of spiritual food. That is why to those who are regenerated spiritually it becomes reasonable guileless milk. To the sick it becomes cabbage and enhances the strength of the soul that is sick. And to those who have trained the senses of their souls to distinguish good and evil, they are given solid food." He concludes saying: "The gifts one receives in this present life, even if they receive it at a perfect level, still it is something minimal and modest compared to future goods." From the above it is clear that the word of God is spiritual manna, which has the potential to nourish all people without exception, having the ability to change milk into solid food, depending on the spiritual state of the one who listens to it or studies it. The Holy Fathers of our Church, who interpret Holy Scripture infallibly, we do not judge, but we listen to them or study their words with humility, fear of God and love. Thus we have the ability to feed ourselves spiritually, to support ourselves, and to gain spiritual antibodies that we may endure difficulties. Source: Ekklesiastiki Paremvasi, "ΟΣΙΟΣ ΜΑΞΙΜΟΣ Ο ΟΜΟΛΟΓΗΤΗΣ", January 2008. Translated by John Sanidopoulos.